Being the romantic that I am, to celebrate our first anniversary of dating I took my now wife, Demelza, to the 2003 Stop the War march in London. We got about a quarter of the way around before it turned out that Demelza didn’t really like marches, so we headed into a bookshop on the route to watch the rest of the crowds go past. It made me appreciate that not everyone is into marches, or the approaches to activism that are often the first that we encourage people to take in campaigning. It’s one of the reasons I’ve come to appreciate the Craftivism (Craft + Activism = Craftivism) led by inspiring people like Sarah Corbett, despite not being a natural candidate to get out my needle and thread out. It’s easy to scoff at craftivism. What difference does it make? Wouldn’t our resources be better focused on organising another march or stunt? For me there 3 reasons why even the non-craft minded campaigner should be grateful that craftivism exists. 1 – Perhaps less is more? 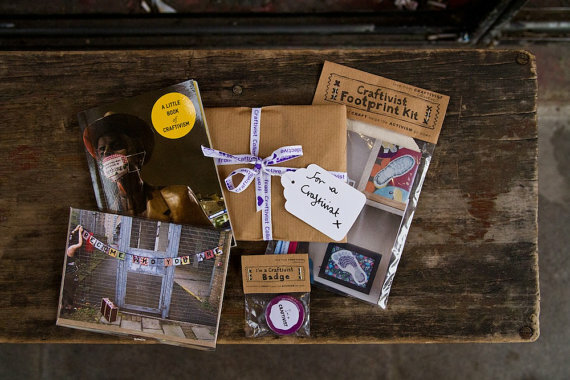 Craftivism presents an opportunity to do something different. This collaboration between Share Action and the Craftivist Collective targeting M&S shows that craftivism probably won’t lead to bulging postbags, but it can still have an impact on the ‘target’. Indeed this research suggests that for some decision the greater the volume of constituent contact they get the more they may devalue those grassroots lobbying efforts. 2 – Use the whole brain – Even for a campaigner who thinks that they’re the most uncreative, craftivism provides an opportunity for creative escape. It’s an opportunity to get creative, and reflect on how to solve problems using both right analytical and left creative sides of our brains. 3 – It’s good to slow down – As the Craftivist’s Manifesto says its all about slowing down and taking a ‘thoughtful approach to mindful activism’. In an environment where we spend so much time rushing from tactic to tactic, often fuelled by the excitement of social media we all need to find ways to practice mindfulness. Craftivism can help to provide that. If you’re interested in learning more about Craftivism have a look at this training day that’s running on 10th December, and if you’re (already) stuck for ideas for Christmas, then Craftivism Collective’s shop is a good place to start.